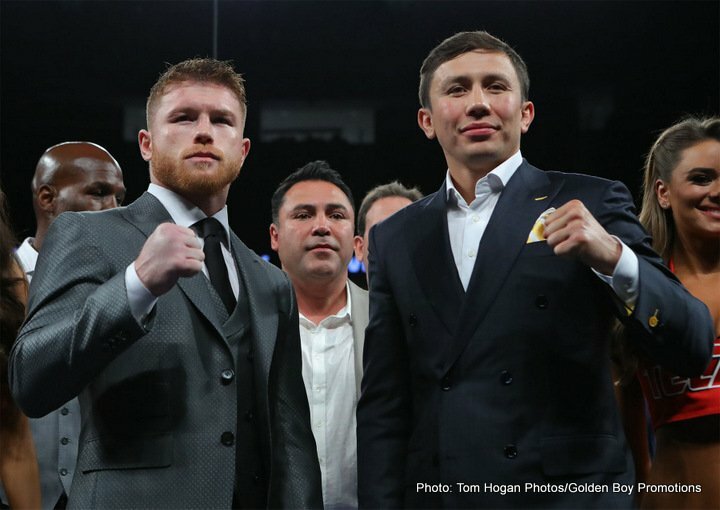 By Dan Ambrose: Saul “Canelo” Alvarez cannot compete with the power that Gennady “GGG” Golovkin has going for him, according to GGG’s trainer Abel Sanchez. Golovkin (37-0, 33 KOs) will be putting up his IBF, IBO, WBA and WBC middleweight titles against the highly popular Canelo (49-1-1, 34 KOs) in a little over 3 weeks from now on September 16 on HBO pay-per-view at the T-Mobile Arena in Las Vegas, Nevada. Sanchez hasn’t changed his mind about Canelo not having similar power as the 35-year-old Triple G. Sanchez still views Canelo as a “slapper” and not a big puncher. Sanchez knows what big punchers are at the middleweight level. He’s seen Daniel Jacobs fight, and feels he’s a big puncher at 160, but not Canelo. Canelo can punch a little when he sits down on his shots, but he doesn’t do that much when he’s being put under duress. Canelo tries to throw fast shots, and that takes away a lot of his power. But even when Canelo is sitting down on his shots, he doesn’t possess the power to get his opponents out with a single shot. Canelo must bludgeon his opponents with continuous shots over many rounds for him to get knockouts when he’s facing guys with normal punch resistance. The early knockouts that Canelo has gotten in his career have come against mostly smaller fighters and guys with weaker punch resistance. Those are mostly obscure fighters that few boxing fans have ever heard of. The ones that the fans do know about were often over-the-hill, fragile-chinned or outsized by the bigger Canelo. Amir Khan was picked out form the welterweight division to move up to middleweight to fight Canelo last year. Josesito Lopez was fighting at light welterweight (140 lb. division) when he picked to move up to junior middleweight (154-lb. division) to fight Canelo. Cintron and Baldomir were arguably over-the-hill when they fought Canelo. In looking over these 2 lists of past Canelo knockouts, it seems patently obvious that he’s not a big knockout artist in the same class as GGG. Canelo is a guy that knockout weak-chinned or older fighters, and a lot of flawed 3rd tier guys. As such, most of Canelo’s knockouts have come against fluff opposition, and in no way, does it given accurate portrayal of the redheaded Mexican star’s true knockout ability or lack thereof. ESPN commentator Teddy Atlas and HBO unofficial scorer Harold Lederman both opined recently that Golovkin is starting to show signs of aging due to how he’s looked in his last 2 fights against Danny Jacobs and Kell Brook. Even though Golovkin won both fights against fighters that chose to move a lot, Atlas and Lederman feel that GGG is starting to show his age at 35. Sanchez doesn’t agree with either of them, as he feels that Golovkin is still in his prime and fighting at a high level. It’s hard to say that Golovkin is aging from looking at his last 2 fights. Brook ran much of the time after being stunned in the opening round by a left hook from Golovkin in their fight in September 2016. Although Brook did land some shots in the fight, he was eventually stopped in the 5th round by Triple G. Brook was walked down by Golovkin, who didn’t seem to care whether he was hit or not in that fight. Golovkin was on a seek and destroy mission in the Brook fight, and he didn’t care whether he was hit or not. Golovkin was willing to walk through Brook’s weak shots to get him out of there quickly to impress or infuriate the boxing fans. Golovkin-Brook was staged at the O2 Arena in London, England. Brook had the crowd on his side, so Golovkin had more than a few fans rooting against him in that fight. For his part, Jacobs used a lot of movement against Golovkin in their fight on March 18. Golovkin had a mobile fighter on his hands, which appeared to have at least a 10-lb. weight advantage over him. Jacobs looked big for that fight. For all intents and purposes, Golovkin was fighting a super middleweight and not a middleweight. It’s a credit to Jacobs that he could make weight, given how huge he looked after rehydrating. There’s nothing wrong with Sanchez speaking his mind in giving his opinion on the Canelo vs. Golovkin fight. That’s what Sanchez feels. Obviously, Sanchez doesn’t want to give Canelo a rallying cry for him to get hyped up more than he already is for the Golovkin fight. The main reason why Sanchez isn’t saying it’s a prediction is because he doesn’t want to create undue pressure on Golovkin to make him feel like he’s got to live up to his trainer’s expectations for the fight. Golovkin already knows full well that he’s going to need to knockout Canelo to make sure he doesn’t get potentially robbed in the fight. We’ve already seen 2 fighters that did well enough to deserve decisions against Canelo wind up on the losing side of decisions in Erislandy Lara and Austin Trout. Those guys got the better of Canelo, but still lost to him due to the judges seeing those fights a unique way. Sanchez still isn’t happy with the way that Lederman and Atlas are suggesting that Golovkin has lost a step and is starting to show age. Atlas has seemed down on Golovkin for some time, even before his fights against Brook and Jacobs. It’s not all that surprising that Atlas isn’t saying a lot of positive things about GGG right now, because he wasn’t saying good things about him before he took those 2 fights. It’ll be interesting to see what Atlas says about Golovkin if he knocks Canelo out. Does Atlas give Golovkin credit for the win or does he choose to say that Canelo was unproven and not very good? I wouldn’t be surprised if Atlas chooses to discredit Golovkin’s win by pointing out Canelo’s limitations. It doesn’t matter what guys like Lederman and Atlas say about Canelo or Golovkin. Ultimately, they can’t predict the future, and they won’t be in the ring throwing punches on September 16. If Canelo is good enough to beat Golovkin now, then he probably would have been good enough to beat him 2 years ago when the Kazakhstan fighter was considered still in his prime in the eyes of Lederman and Atlas. Not enough has changed in Golovkin’s game for the fight outcome to have been any different had he taken the fight with Canelo in 2015 instead of now. Golovkin is still punching with the same power, and he still has the same style now than he was back then. Golovkin used his jab against Jacobs this year, and he was jabbing David Lemieux in their fight in 2015. There’s no difference in Golovkin’s fighting style or his ability. If you look at Canelo’s game from 4 years ago when he fought Floyd Mayweather, he couldn’t deal with a jab back then, and he’s still struggling to handle jabs even now. Amir Khan out-boxed Canelo for the first 5 rounds last year, using his jab and fast combinations. Canelo looked limited in that fight. That was probably the last decent opponent Canelo has faced. His last 2 fights have come against poor opposition in former paper champion Liam Smith and a weight drained Julio Cesar Chavez Jr.
Khan was a tougher test for Canelo than either of those guys, even though he ended up getting knocked out. If Khan had any kind of punch resistance, he would have out-boxed Canelo and beaten him. However, with the way the judges were scoring that fight in giving Canelo all the rounds, Khan would have still lost even if the fight had gone the full 12 rounds. That’s another reason why Golovkin is going to need to make sure he knocks Canelo out on September 16. I don’t have faith that the judging will be good for this fight. I’ve seen the way the judges scored the Canelo-Lara, Canelo-Trout and Canelo-Khan fights, and I think there’s little chance that Golovkin can beat Canelo by a decision unless he knocks him down half dozen times.